Business leaders and councillors in a county which has been without traffic wardens for six months claim parking problems are getting worse. Ceredigion's three wardens stopped working after control over parking switched from police to the county council on 31 May. Ceredigion council said last month that new parking wardens were expected to be on patrol from next June. Business leaders said they could not understand why it was taking so long. The council is submitting an application to the Welsh government to create a parking enforcement area. It is proposed that seven parking officers will manage on-street parking and council-run car parks from 4 June. 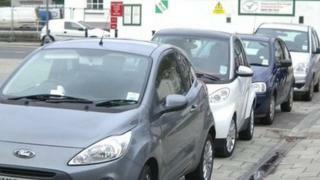 Aberystwyth mayor Richard Boudier said parking problems in Aberystwyth had worsened over the last six months. "The students have returned to the town in the last few months and they've taken up parking spaces in the town, which means there's less for everybody else," he said. "Inconsiderate drivers are parking on pavements, in disabled parking bays and they're parking on dropped kerbs reserved for people with wheelchairs and pushchairs. "The annoying thing is that parking spaces are available in the town's Mill Street car park, but people feel the need to park illegally in the town centre which is increasing congestion. "I think this problem could have been solved by the county council a lot quicker than it has been." Joint chair of Aberystwyth Chamber of Commerce, Chris Mackenzie-Grieve, said he could not understand why it was taking so long for the council to introduce parking wardens. "People don't just talk about the weather when making polite conversation in Aberystwyth, they talk about the parking problems as well. It's been a constant theme for six months," he said. "There are still problems and they have got worse since the students have come back." In Cardigan it has been a similar story. Mayor Catrin Miles said drivers were parking in loading bays which sometimes brought traffic to a standstill when lorries were trying to make deliveries. "People don't use the public car parks and tend to park in the town centre illegally in loading bays and disabled parking spaces," she said. But Mrs Miles said public car parks across the county would be free in the run up to Christmas on 10, 17 and 24 December. Ceredigion council has been asked to comment.